You know what that means, love is in the air and so is the aroma of fresh baked cookies. Sugar cookies. There is nothing more special than some personalized cookies to celebrate an engagement, bridal shower, or wedding, is there? (Debatable, but for my purposes we’re going with it.) There’s just something I love about wedding activities in the summer. My friends are getting married, engaged, having babies, and I’m just making cakes and cookies for the occasions. My apartment constantly smells like amazing desserts and that is definitely okay by me! I really do love making cookies and cakes for special occasions like this. I feel so honored that my friends and family ask me (and trust me) to do them for such big moments in their lives. In some way it makes you feel more a part of it. 1. I’m kind of obsessed with anything monogrammed. 2. The subtle white on white details with just a little pop of pink are delicate, yet fun. So if you’re looking for cookies for a unique dessert table, or some edible party favors, you don’t need to look any further! **Bonus! It’s National Sugar Cookie Day today! Who knew! You can check out a few of my favorite sugar cookie designs here. These wedding cake sugar cookies are simple and elegant. 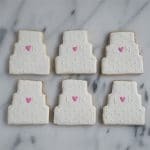 Using a gluten-free sugar cookie and topped with royal icing and a simple design, they are perfect for any engagement party, bridal shower or wedding. Using a cake shaped cookie cutter, cut shapes into the dough. Place cookie dough shapes on a parchment paper lined cookie sheet and place in the freezer for 10-15 minutes. Then, bake cookies in the oven at 375 degrees Fahrenheit for 8-10 minutes. The cookies should not brown completely, but the edges can be slightly browned (that’s a good indication it’s done). Cool on a wire rack. Outline the cookie using white icing (10 second icing). Flood with thinned out white icing (4 second icing). Let dry completely. Using a pastry bag fitted with a number one tip, make the dots on the cookie in your desired pattern with the white icing (10 second icing). Also, carefully write out the initials of the couple on the middle tier of the cookie, leaving a space in the middle for the pink heart. Using a pastry bag fitting with a number 2 tip, make "V's" in between the monogrammed letters using the pink icing (10 second icing). Depending on how much the icing has been worked, it will spread out a little bit forming a heart. It's best to start with a "V" and then curve the heart from there. Instead of the gluten-free flours and xanthan gum, you can also use 2.5 cups of all-purpose flour.